"What this modern saga of the Northwest Passage brings to light is the new image of the passage as canary in the coal mine. A warning sign of vast planetary changes - caused by us - and threatening our future." "A compelling page-turner of an adventure story. 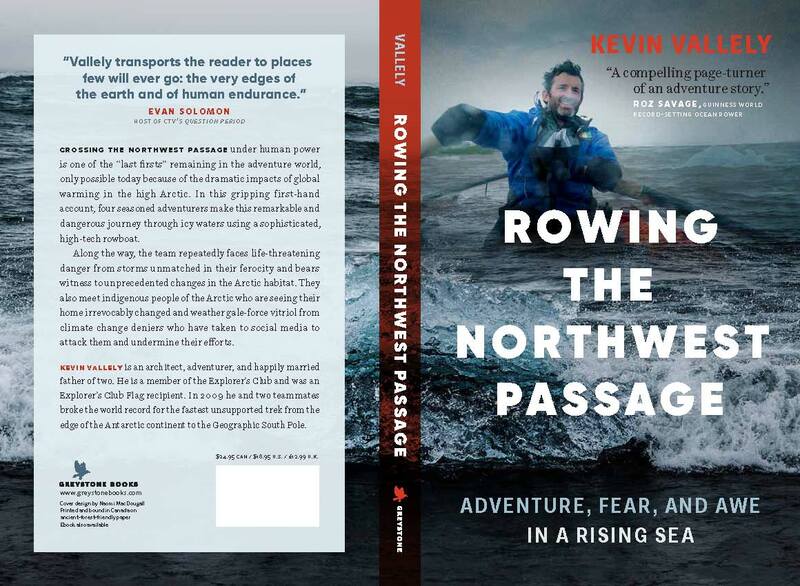 Rowing the Northwest Passagegave me a greater appreciation of the Arctic wilderness—just not as a place of brutal beauty, but also as a crucial player in the Earth’s ecosystem." "Vallely transports the reader to places few will ever go: the very edges of the earth and of human endurance." "A thrilling adventure tale in which each hard mile not only reveals the strength of the human spirit but also hammers home the hard truths of climate change." "Combines a fantastic tale of adventure with an important message on the state of our environment. Vallely's writing keeps the reader engaged with beautiful descriptions of the people, landscapes and wildlife he encounters." —Colin Angus, author and National Geographic Adventurer of the Year. "A must-read for any Arctic or Northwest Passage enthusiast or for anyone concerned about our planet's future in the face of global warming." "A powerful call to action wrapped in a rich tale of adventure, history and the harsh reality of a changing climate."